The package is nicely organized, thematically rather than chronologically, though the early and late short pieces are grouped together. After the early works (CD 1), we have “songs & dedications”, which includes rarities such as the composer’s own arrangements of some of the Op. 16 romances. CD 3 includes the two full piano sonatas, “The Seasons” occupies CD 4, “Children Album” and the complete “Morceaux” Op. 40 & 51 are on CDs 5 & 6. CD 7 includes “late works”, the most significant of which is the opus 72 Morceaux. This is also where the similarity with another famous “complete” survey of this music, by Viktoria Postnikova(Erato), ends. The rest are works with no opus number, including the complete “Russian Folk songs”, played 4 hands with Lisitsa’s partner and recording producer, Alexei Kuznetsoff, and Tchaikovsky’s own, rarely heard arrangements for “The Nutcracker” and some orchestral pieces. Tchaikovsky’s piano music is a rather uneven affair, with the early as well as some of the late pieces heavily influenced by great piano masters such as Liszt, Schumann and Chopin. In the later pieces, there is some pianistic awkwardness and a nagging repetitiveness that even the best of pianists fail to disguise. From the first 2 CDs, the better works are also the better performed, namely the “Valse-Caprice, Romance Op. 5 and the mentioned Op. 16 romances, with a true singing tone and voice shading. On the other hand, slower pieces such as the Nocturne from Op. 19 tends towards a standstill, as well as portions of the variations on an original theme from the same opus. The Grand Sonata in G is rather ponderous in the opening movement’s introduction (but so is the music itself), but the appearance of the new seductive theme at 3:00 is wonderfully fluid. Compared to Joseph Moog’s recent release of this sonata, he is more attractive in the opening subject, but less impressive in the more lyrical segments. The technically demanding coda, in Lisitsa’s hands, is impossibly effortless. Still, both are no much to the natural charm of Pletnev and Richter’s take on this piece. The long slow movement in the current version shows some impressive pianistic skills and is nicely voiced, though Moog’s more flowing tempo might have made Lisitsa’s version even more successful. Here it’s worth noting that throughout the more known pieces, Pletnev is Lisitsa’s most prominent contender as a Tchaikovsky interpreter. The 12 “Seasons”, Op. 37a are very successful here, with a sincere, touching feel for the quiet movements and sparkling brilliance in the faster episodes. Pletnev is calmer, warmer and not much stickler to the score. Preferring one is a matter of taste as always, with Lisitsa more inlined with Ashkenazy’s account from the same label. The 24 pieces which compile the “Children Album”, Op. 39 is one of the best performances in the box set. A version that is touching with its simplicity without sounding one bit monotonous or, like on other performances, simplified or primitive. Lisitsa projects a heart-warming naiveté in these works, with a version to be treasured. With the late Op. 72, there is good exchanging of moods and handling of the sometimes thick piano writing. That being said, some will be put off by the rather direct manner of which Lisitsa deals with the sentimental numbers such as the third, “tendres reproches” or fifth “Méditation”. These pieces were the highlight of the Postnikova cycle, and again Pletnev remarkable version for Deutsche Grammophon is an achievement never surpassed. The less familiar Theme and Variations in A Minor is another success, which makes one wonder why this set isn’t played more often. Another successful rarity is the “Russian Folk songs”, well synchronized by the two pianists (or four hands), resulted in a much better account than Cyprien Katsaris and Alexander Ghindin’s version of these pieces from a few years back. The choice of Tchaikovsky’s own arrangement of his “Nutcracker” ballet maybe commendable, made by the composer to simplify a more demanding arrangement by Taneyev, but it’s also less exciting and a no match to the famous Pletnev’s “concert suite” arrangement. Though choosing this less memorable version, Lisitsa performance is well characterized and makes the best out of this sometimes over-simplistic reduction. Throughout, there is an integrity and persistence of approach to the music, a solid impression of an accomplished artist. Some will embrace Lisitsa’s directness as being refreshing, some will want a more spontaneous approach. The instrument chosen is another element needed to be accounted for – a Viennese Bösendorfer, which offers a rather short decay and punchy brilliance on the higher registers. 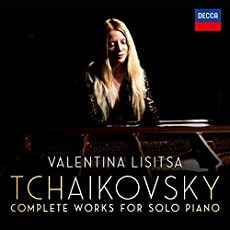 This is a nice package for anyone who wants to get familiar with the entirety of Tchaikovsky piano music played by a single artist, and for Lisitsa’s many admirers. It is also recommended to add additional versions to the more canonical pieces offered here, some listed below.